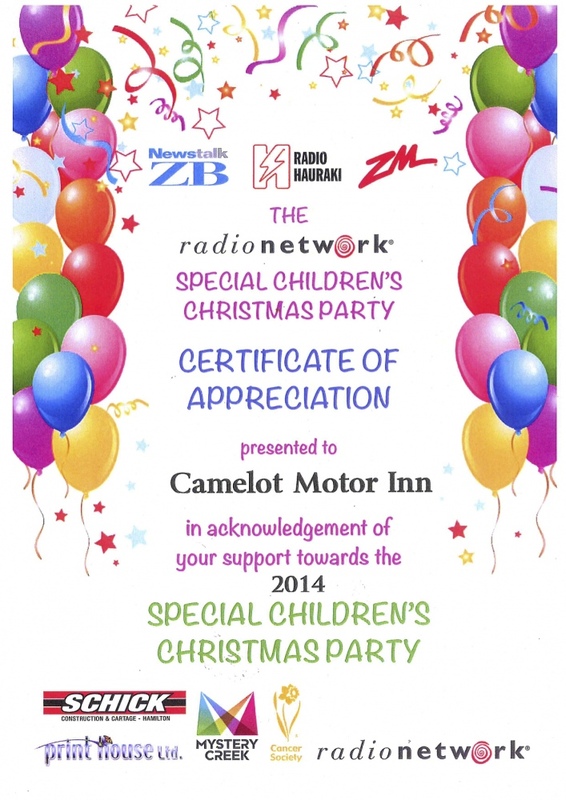 In an act of Social Giving, leading Hamilton accommodation provider Camelot on Ulster gave much needed complimentary accommodation for the team that organised The Radio Network Special Children’s Christmas Party. The Radio Network Special Children’s Christmas Party provides a remarkable experience for terminally ill and disabled Kiwi kids. “We provided The Radio Network Special Children’s Christmas Party team with complimentary accommodation for the four nights that they were here in Hamilton,” says Alix Stevens who is in charge of the operational management of Camelot on Ulster in partnership with her fiancé, Mark Boe. Camelot on Ulster’s spacious and quiet rooms gave The Radio Network Special Children’s Christmas Party team much needed rest and relaxation during their stay in Hamilton. “We are centrally located so the team could get around Hamilton very easily and our rooms are quiet so they could still get a good night’s sleep,” says Alix. Having recently upgraded their rooms and facilities, Camelot on Ulster provides modern, clean and spacious accommodation that is affordable in close proximity to the Hamilton CBD.